Precision. Balance. Comfort. The Zwilling J.A. Henckels Pro Bread Knife delivers all three with its wider serrated blade and curved bolster. Premiere Italian architect and designer Matteo Thun designed the serrated bread knife's unique wedge-shape. 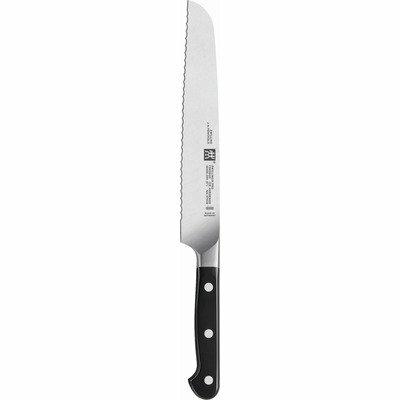 Produced by Germany's legendary knife maker, the professional-grade 8" bread knife is precision-forged from a single piece of Zwilling exclusive formula stainless-steel. The razor-sharp serrated blade is exceptionally hard yet flexible for slicing baguettes and round loaves to cakes and frozen desserts. Backed by years of design testing, the high-carbon blade is ice-hardened for superior strength and sharpness and resists stains, chips and rust. Precision lasered for a premium angled blade, the Zwilling Pro Bread Knife allows for cutting, slicing and sharpening along its full edge from bolster to tip. The arched bolster supports the thumb and reduces hand and wrist stress for comfortable, controlled cutting of softer foods with a hard skin or crust. Contoured ergonomic polymer handle features a triple-riveted full tang and edgeless joints for a smooth, safe grip. Virtually indestructible, serrated bread knife is honed and hand-finished and dishwasher-safe, although hand washing is recommended to maintain maximum sharpness.